The sculpture, 'Suza', or teardrop, is in Tuzla, Bosnia, near the spot from which Jews, Gypsies, and partisans, Serb, Muslim or Croat, were sent to the Nazi camps. JANUARY 27 was the date officially designated Holocaust memorial day in various countries. It was on January 27, 1945 that Red Army troops liberated Auschwitz-Birkenau concentration camp in Poland from the Nazis. On May 8, 1945, British troops liberated Belsen. Israel, and many Jewish communities, commemorate Yom Hashoah in late April. Many of us, particularly Jewish Socialists, prefer to commemorate resistance, and the April 1943 Warsaw ghetto revolt. Whatever the arguments about having one day, or which day, dedicated to remembering the Nazi genocide, and however much we detect hypocrisy or distrust the motives of governments, the continuing need for education can be demonstrated. Under the headline "Young in the dark about Shoah", the Jewish Chronicle on January 19 reported on a poll. 'Asked whether the Holocaust was a “myth”, “had happened but its scale had been exaggerated”, or that “six million Jews had been killed”, 28 per cent of 18- to 29-year-olds responded that they did not know. The overall percentage of “don’t knows” was 17 per cent'. Actually the poll result was less worrying than suggested. Fewer than one per cent of those interviewed believed the Holocaust was a myth, or thought Jewish deaths and suffering had been deliberately exagerrated. "97% percent of people are aware that Jewish people were victims of the Holocaust, yet around half the population are not aware that Roma and Sinti, and Gay and Lesbian people and disabled people were also persecuted. This figure increases to over 75% in the case of the Black victims of Nazi discrimination". When Britain held its first Holocaust Memorial day in 2001 some friends had quite a fight to get Roma representatives invited to the official event. For all the use of the buzz word "inclusion" back then, the British government was excluding Roma refugees from poverty and persecution in the newly "free" countries of eastern Europe. The right-wing press was working up prejudice against them, and Gypsies in general. It still is. The Jewish Socialists' Group, joined by other anti-racists, including Iranian refugees, highlighted media hypocrisy with a Holocaust day picket on the Daily Mail. The leaflet distributed outside its Kensington offices compared its pre-war pro-Hitler and anti-refugee line with its current obsession with attacking asylum seekers. One lady agreed with the leaflet but asked me whether we would demonstrate outside the Daily Express as well. She was quite right to suggest this of course. On a positive note, the Holocaust Memorial Trust and some local authorities have included other genocides and made the link between Nazi antisemitism and other forms of racism. I was pleased to see an Ealing council paper brought out for the commemoration featured an item on the Armenian genocide of 1915. It was Winston Churchill, I think, who first used the word "Holocaust" - from a Greek term for sacrifice by fire - referring to reports of Armenians being thrown into pits and burned. There are Armenians in Ealing, some of whom became refugees a second time when Cyprus was invaded, and have made a contribution to local refugee and community relations work. This year the attention given Holocaust Memorial Day has varied. In Scotland, Holocaust Memorial week was marked by various bodies, ranging from the Grand Masonic Lodge to the Scottish Palestine Solidarity Campaign, which arranged readings of Jim Allen's play Perdition, which deals with the way Zionist leaders in Hungary kept the Jewish community unaware of what was planned, colluding with the Nazis so they would allow the flight of selected persons. To accompany this there was a tour by Lenni Brenner, author of Zionism in the Age of the Dictators. The Morning Star (Wednesday January 24) misleadingly reported protests that Holocaust week organisers "removed events by Palestinian activists from their website" (Activists attack 'censorship' of Palestine in Holocaust event). This was misleading, because the people running the Scottish PSC are not Palestinians, and the Jim Allen play is not about Palestine. However, it was not as misleading as claims by some opponents that '“Perdition” is a poor-quality dramatisation of one the themes of the anti-semitic campaign launched by the Soviet government in the late 1960s' on Nazi-Zionist collaboration (Stan Crook in Workers Liberty) or that 'as far as the Scottish PSC is concerned, the best way to remember the Holocaust is to remind everybody that the "Zionists" were responsible for it' (someone calling himself 'Mikey' on the Engage site). Jim Allen is no longer around to defend his play (he died in 1999), but he did explain his views very thoughtfully in an interview with Jewish Socialist, published alongside criticism of the play by David Cesarani in Spring 1987. Unfortunately it seems to have escaped the research of Crook and "Mikey". I knew Jim Allen in Manchester back in 1959-60, when he edited a rank-and-file miners' paper. He was neither a Stalinist nor an antisemite - he had a record of fighting both. He made his name as a writer with work on trade union struggles and social issues, before working with Roland Joffe to prepare a series of films on fascism for which they never got backing. Perdition, written in the years after the 1982 Lebanon war, wrestles with issues of leadership and betrayal, which Jim felt he knew from experience in the labour movement, but it is based on real events in Hungary, which had led to a major scandal in Israel, and inspired Ben Hecht's 1961 book Perfidy. Rudolf Kastner, the Zionist leader at the centre of the true story, was assassinated in Israel in 1957. My late friend Maxim Ghilan was among the "usual suspects" detained and questioned, though it turned out that the person who killed Kastner was a police informer. I don't know whether Perdition is a good play. I'm not a drama critic (but nor were Martin Gilbert, Stephen Roth, Cesarani and other committed Zionists whom 'Mikey' cites as "respectable historians"). But I do know that it does not do anything as stupid as "blame the Zionists for the Holocaust". How material it is to Scottish Palestine Solidarity, or whether it was an appropriate way to mark Holocaust memorial day is another matter. Scottish PSC were on better ground talking about the repercussions of Europe's Jewish tragedy on the people of Palestine, to which they could have added that the very countries which had closed their doors to refugees from Nazism then backed partition at the UN, and contributed to the Palestinian Nakba. Care must be taken not to seem as though counterposing one tragedy to the other, of which it was a continuation; and solidarity campaigners need to be able to distinguish between Zionist censorship and the genuine sensitivity of ordinary Jewish people, if we are to win over the latter. On to Bolton in Lancashire, where it seems there was no problem deciding how to mark Holocaust memorial day. The local council had delegated its responsibilities for this to an "Inter-faith council" comprised of Christian, Muslim and Hindu representatives, who decided that there was no need to do anything as there were "no Jews in Bolton". Canon Michael Williams, treasurer of the Interfaith Council, said: "The service is a bit artificial because we have never had a Jewish community to support it". They said they would hold a more inclusive "genocide day" in June. But news that the Holocaust memorial day had been scrapped brought an outraged response from many local people. "It is difficult to imagine anything more shameful than the cancellation of the Holocaust Memorial Day’s observance in Bolton, " wrote reader Harriet Grimsditch in a letter to the Bolton News.
" Would Remembrance Day be cancelled because there is no-one living in Bolton who served in the 1914 -1918 war? Holocaust Memorial Day is not only to honour the memory of all those who died as a result of the Holocaust, the millions of Jewish people, Roma, Communists & those who resisted fascism. It is, equally importantly, an opportunity to consider the meaning of Never Again, to consider how fascism established a stranglehold on the countries of Germany, Italy, Spain & Portugal &, with the shameful collusion of many & heroic resistance of some, became dominant throughout Europe." "At a time when there is an alarming rise of Islamaphobia, it is especially important to understand the role of Anti-Semitism in the rise of fascism in Europe during the 1930’s. Finding a person or community to blame for the difficulties of poverty in the 1930’s, or terrorism now is scapegoating. The only way to avoid history repeating itself is to study it, honour the victims & learn from those who resisted". Harriet added that "The Council should also explain why such an important decision was delegated to an unaccountable religious organisation". After a storm of such letters the council - which confined its own activity to lowering flags on the town hall - has admitted it was wrong. The justification for Holocaust memorial day is educational, but plainly in Bolton it is the educators who need educating. The readiness of political leaders to pass responsibility on to "faith" institutions is all too common these days in Britain. Some Jewish leaders are now blaming Muslims, but whatever we think of the Muslim Council of Britain etc., would Jewish religious leadership, with its tendency to isolate Jewish experience and concerns, be much improvement? Should Holocaust education be entrusted to the ultra-Orthodox, who believe Hitler was divine punishment for the sins of the secular, or to those religious Zionists who believe that it was all part of the Almighty's wise plan which led to the State of Israel, so that's alright then? Where would the Gypsies and other victims fit into such vision? 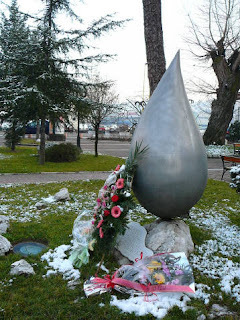 By way of contrast, I was heartened to see the picture above, in the blog of a young Bosnian woman called Jazzy, of floral tributes laid on January 27 in Tuzla, at "a memorial for all genocide victims, called ‘Suza’ which means teardrop by Pero Jelisić. On this very spot was a railway station, where from many Jews, Bosnians, Serbs, Croatians, Gypsies, Partisans were taken to concentration camps into their death". I was in Tuzla, a mining town twice during the Bosnian war, when the BBC used to refer to it as a "Muslim stronghold". Yes, the majority of its people are Muslims, if not very religious, but there are also Croats, Serbs, and a few Jews. The mayor was a Social Democrat. I met partisan veterans who told me they had not dreamed they would have to resist fascism again. The Muslim population was swollen when survivors of the Srebrenica massacre found refuge in Tuzla. It would seem from our picture that the people of Tuzla have not let more recent experience of war and atrocities prevent them remembering the earlier genocide. Maybe they could teach people here a few things. It seems that following the Holocaust Day debacle someone has managed to count some 123 Jews, including at least one Holocaust survivor, in Bolton. They have even remembered that a local rabbi used to conduct Holocaust day services. I don't know whether the Jew-count included Bolton Wanderers' centre-back Tal Ben Haim, who joined them from Maccabi Tel Aviv for £250,000 in July 2004. He could be moving again this Summer. Chelsea have shown interest, and whatever Sam Allardyce says, the player may be more inclined now to make the move to London. I was relieved to hear the assertion proved wrong that "there are no Jews in Bolton" (bit like "There are no pianos in Japan", quoth James Thurber). Back in the days of my misspent youth in the labour-zionist youth movement Habonim, myself and Mike Leigh were despatched from Salford to Bolton one Sunday morning with a list of addresses from which to gather the takings from the Jewish National Fund blue boxes. See, if you want to know where people are just ask the fundraisers. By way of expiation for the above confession, Saturday, January 27 this year found me at the School of Oriental and African Studies(SOAS), attending the Palestine Society's conference on the Palestinian economy. And a few days later, unbeknownst to me, my old chaver Mike Leigh was among celebs helping to launch Enough!, the new coalition against Israeli occupation in Palestine. So you see, people do change and learn from history. Will nobody stop Dame Pauline?